Last winter Patagonia released their new range of technical packs. 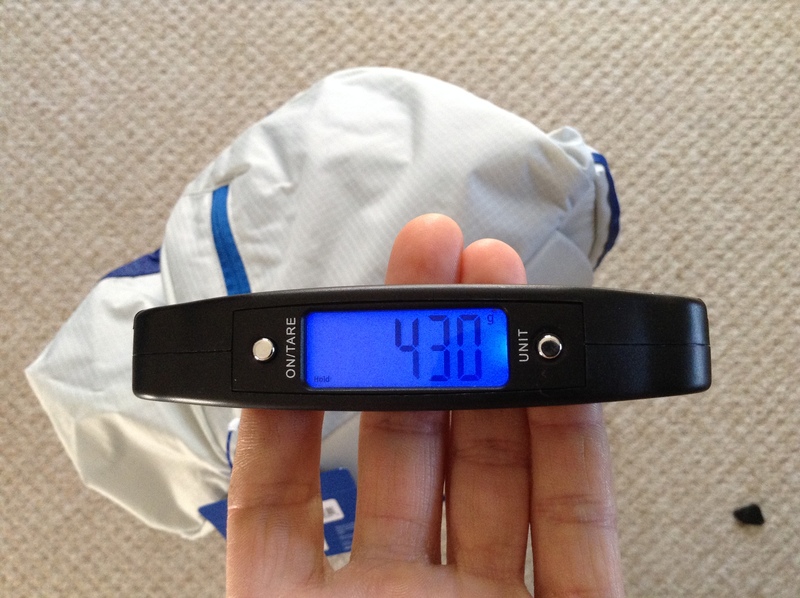 They come in 25, 35 & 45L versions with the two larger sizes having an optional back length. I couldn’t wait to get my hands on one to see what all the hype was about, surely with the input of Alpine legends such as Steve House Patagonia were going to have to produce something innovative that could outshine the competition in a tough market. Sure, I am fussy about my packs, so much so its quite comical to see how many brands and sizes I have tried over the last few years. I want something sleek, lightweight, sturdy with just enough room to fit my gear inside without things dangling on the exterior. 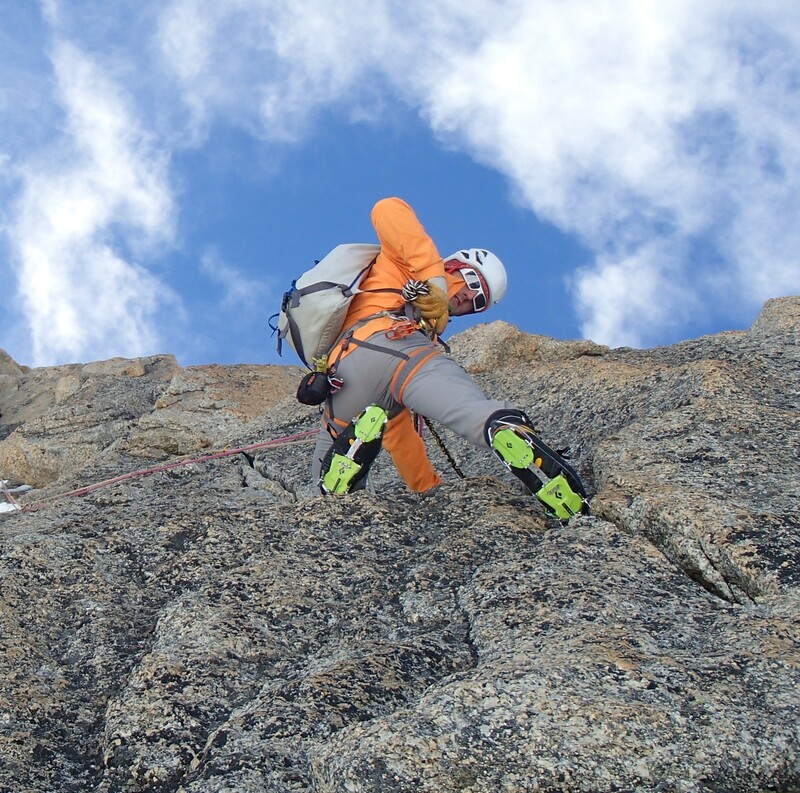 But on the flip side I wanted to be able to climb with it on, so it needed to sit above my harness and compress small enough that it didn’t flap around in the wind. Patagonia had their work cut out…….. The Ascensionist 25L comes in two colours, mine arrived in what Patagonia like to call ‘Tailored Grey’ which is white to you and I. Maybe not the best colour choice for winter as you may well loose the pack should you stash it before climbing, however the bright orange option should take care of this. Straight out the packaging and onto the scales it came in bang on specification at 430g, it also felt surprisingly tough and padded on the back whilst clearly being very light. With hardly any straps the opening system relies on a draw cord that locks down the ‘hood’ which itself houses a small zip pocket. The removable waist belt, chest support and front closure strap being the only webbing aside from the shoulder straps which themselves felt well padded and strong enough to burden a load. Over the last eight months I have used the pack daily from working in the Scottish Highlands to bashing around Alpine mountains. 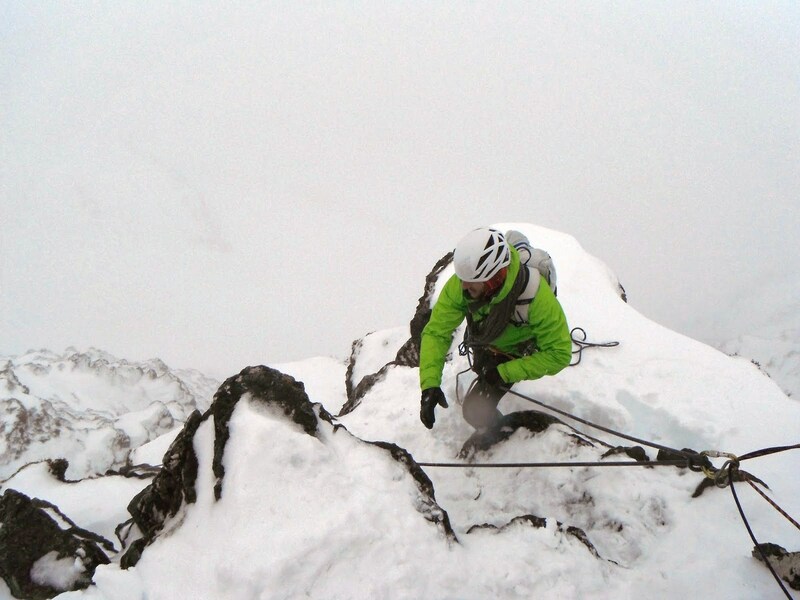 The fabric has stood up extremely well especially whilst working in the Cuillin mountains where the rock type is predominantly course and sharp. Whilst working I have managed to fit everything I need inside the pack, items include: Harness, helmet, 40m rope, modest climbing rack, bothy shelter, first aid kit, headtorch, map & compass, midlayers of clothing, waterproofs, gloves / hat, food & 1L water bottle. I have also managed to use the 25l pack for bivying on Skye which meant adding a lightweight sleeping bag , bivi bag & jetboil. To do this I had to carry the rope on the outside using the dedicated rope carry strap which works well and feels sturdy. 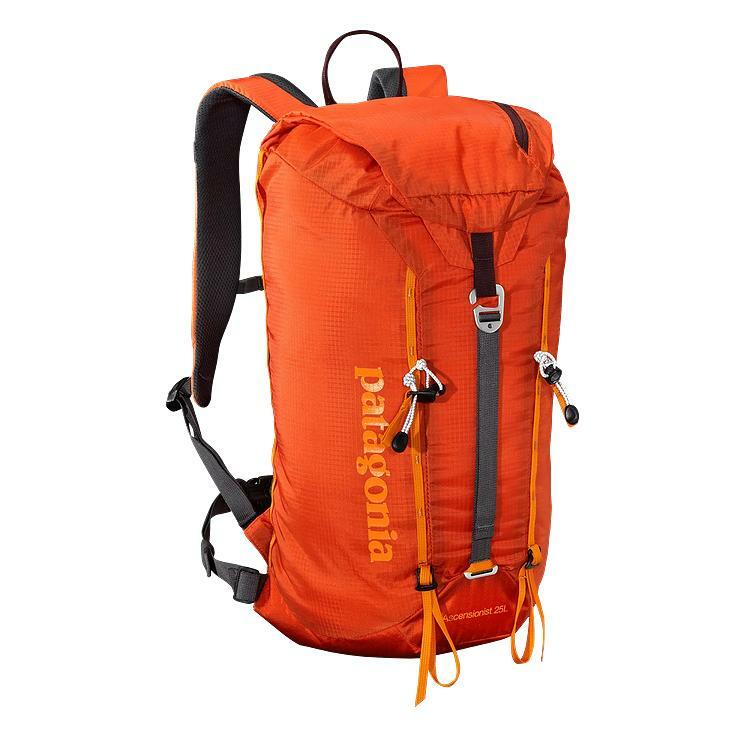 The main compliment I can pay the designers is that not once has it felt uncomfortable, the padded shoulder straps and thin waist belt managing the load well enough to keep the pack well balanced and stable. The innovative opening system which relies on a draw cord and extended hood is simply superb. The lock system draws in tight and stays there whilst packed full to the rim. 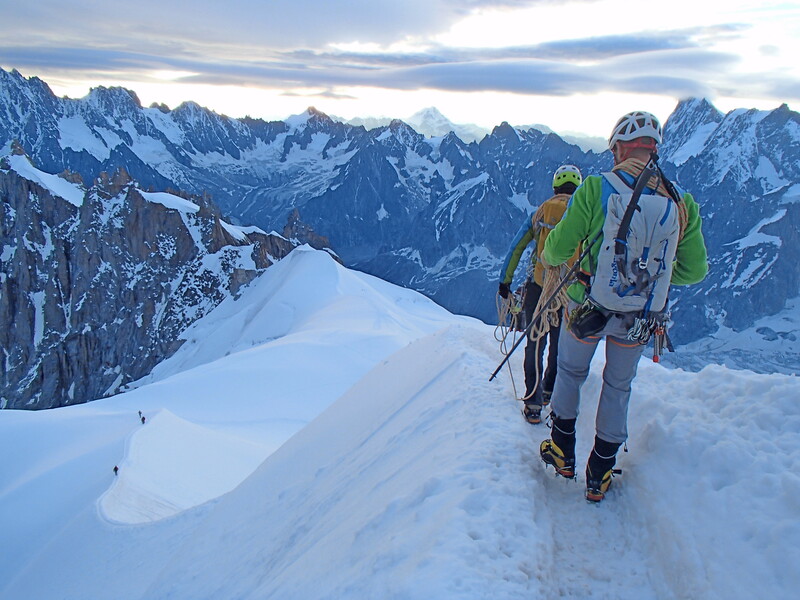 The pack in its Alpine world. You barely know its there whilst climbing. 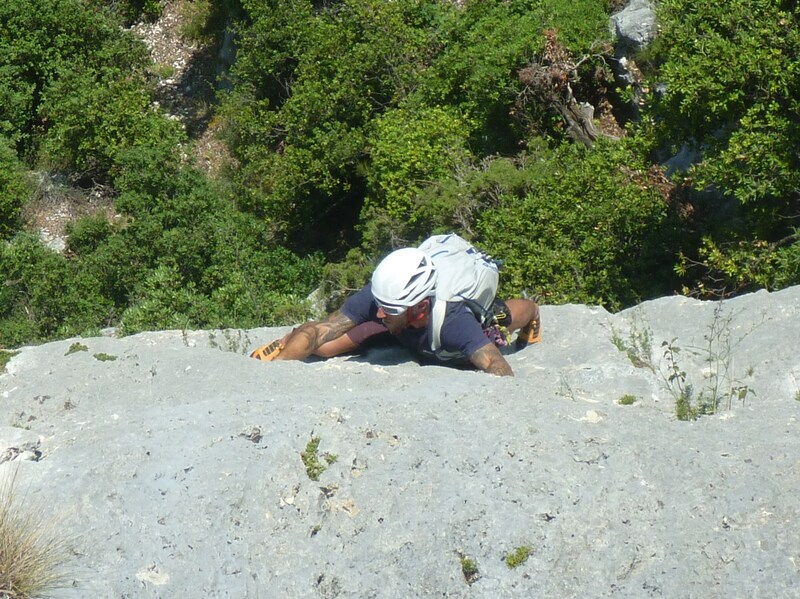 The pack was also used entirely for three weeks Alpine climbing and a further ten days in the Verdon Gorge. 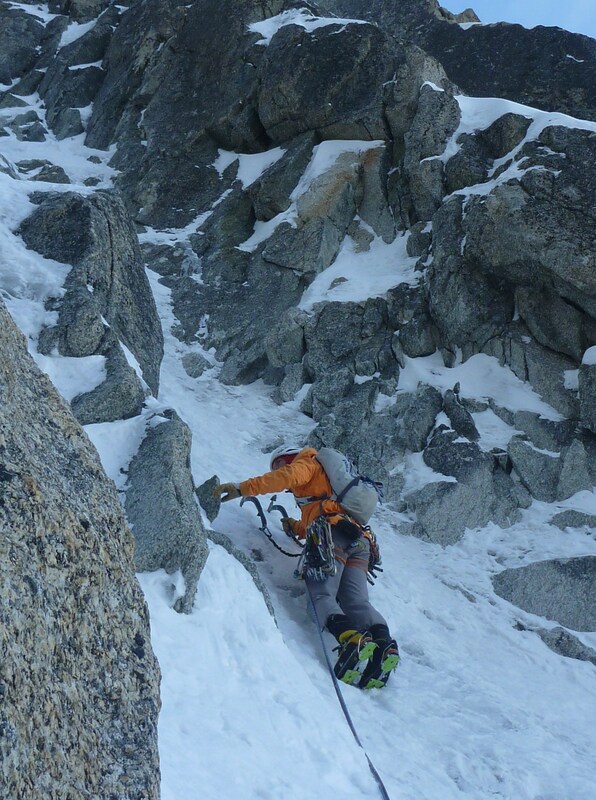 Often in the Alps you find your pack almost empty as you are wearing and using most of your kit from the off. The Ascensionist pack is almost undetectable in these situations, having a very small volume and no frame it hugs your back and sits nicely above the harness and with little / no webbing means there is nothing flapping bit hitting you in the face. Previous packs have been brushed aside due to the frame nudging the back of the helmet whilst looking up a route / belaying, this happens to be my pet hate but thankfully the lack of frame and slender profile resolves this. The ice axe loops are pretty standard, I prefer the securing system on the larger versions but I expect this was another effort to save weight. 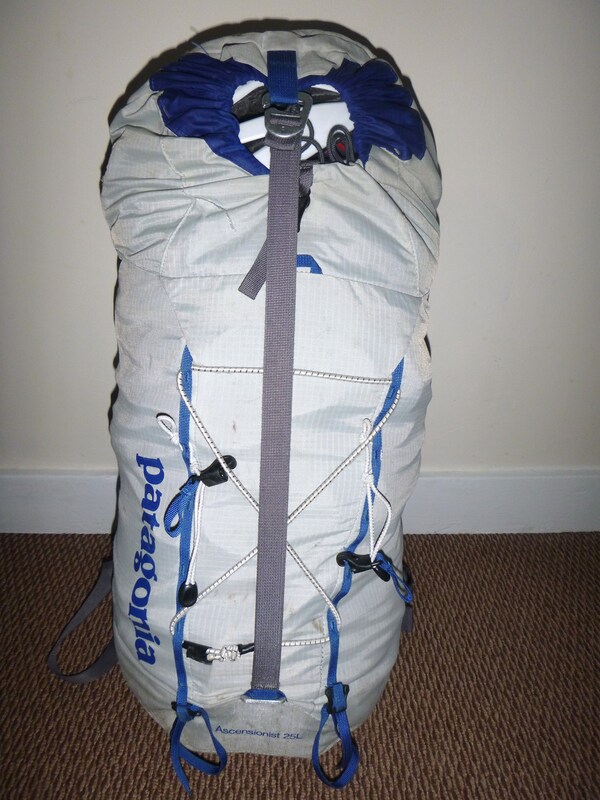 In my opinion the Patagonia Ascensionist 25L pack is the best pack I have used to date. Its in its element in an Alpine and summer mountaineering environment. I am yet to rigorously test it in Scottish winter conditions and suspect the addition of a belay jacket and flask may require the larger 35L version. The 25L might also be on the small side for working in winter months too, those days when you just need to throw everything in and ‘get out of there’ just wouldn’t be possible with the 25L as it does require a certain amount of careful packing. The axe attachment points are a disappointment, there are no compression straps but which is fine with me and I have added cord to secure crampons to the exterior. The innovative top opening and simple yet comfortable design is what the pack is all about, the only way to see how effective it is would be to go have a play with one and see for yourself! NB I have since used and brushed aside in favour of the Ascensionist 25 and hence tested against: Marmot Zelus 25, Blue Ice Warthog, Black Diamond Speed and Haglofs Roc 25. The pack will get a proper workout this winter!